Classic, best selling nursery rhymes book featuring 6 popular nursery rhymes, including Hey Diddle Diddle, Humpty Dumpty and London Bridge. 6 pages feature beautifully illustrated popular nursery rhymes to read and sing along to. Fun sound effects, phrases and light up buttons encourage baby to interact. Develops early language skills, manual dexterity and promotes early reading concepts. 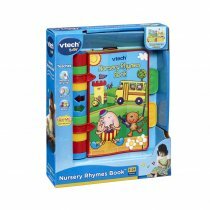 Hard plastic pages are designed to be durable and easy to clean so baby can play over and over again.